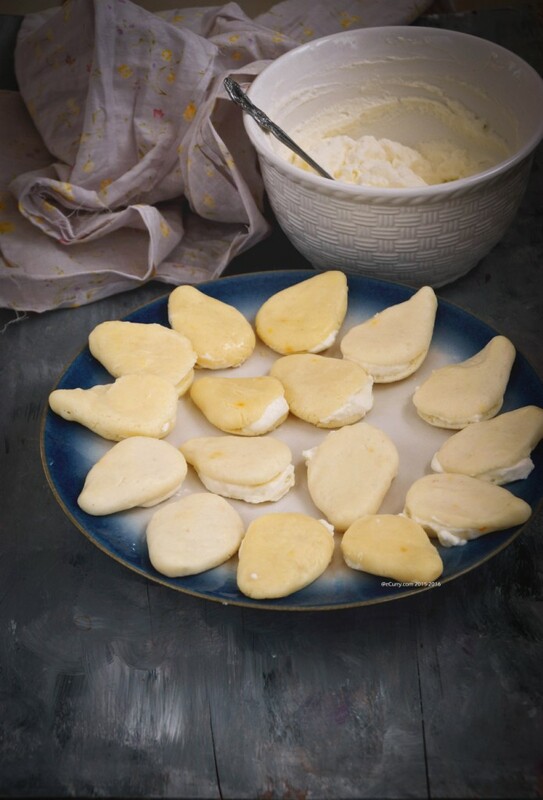 Mishti, the Bengali sweets, are a Bengali’s dream. A Bengali’s pride. 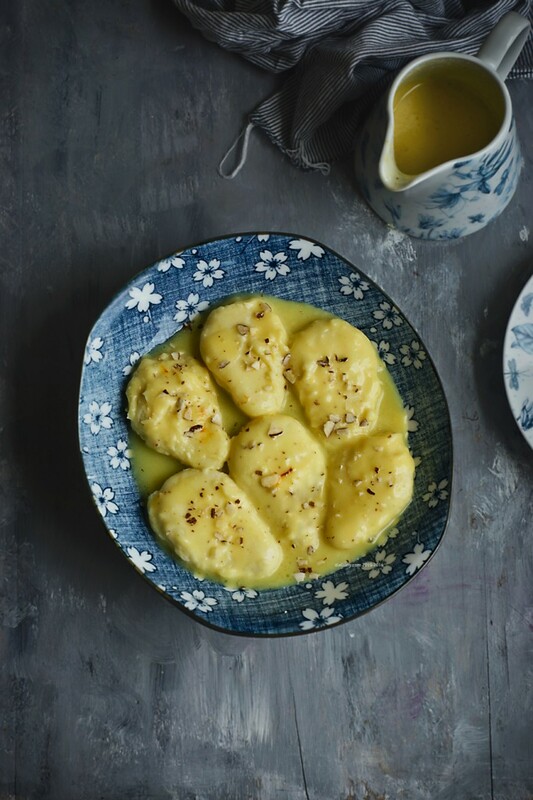 These special regional sweets are an inseparable part of a Bengali’s life. The Kaal Boishakhi could sweep the dust off the world and wash it down, the palm leaves swaying like strands of rain soaked long, dark hair veiling and blowing over a maiden’s face. There would be comfort to watch the rain with Cha (tea), Chom Chom and Adda (a lazy meet). The sweltering summer sun could bring in the intolerable quiet in the late, unhurried afternoon: there is tranquility to stretch out after a lazy holiday nap and curl up in the corner of a heavily shaded room, to bite into the chilled Malai Chom Chom. Ending a meal? Yes. 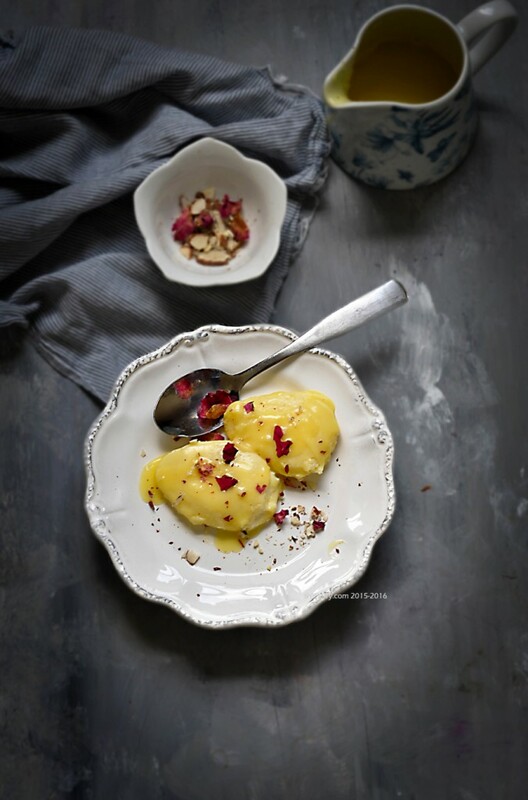 There is nothing more luxurious than a velvety smooth Malai Chom Chom. The astonishing tenderness, the subtle mingling of the cardamom, saffron and rose, is guaranteed to make every bite memorable, every craving satiated. The early evening brings out people in the streets. Shops open for the evening after the afternoon break. Freshened after rest, lingering smell of talcum powder seeping out from the freshly ironed cotton sarees, and long neat braids, the mothers get the children ready to go out and play. “Come back before the street lights are on“, they say. The doors are kept open. Doors were always kept open in our home. Friends were welcome to come in and announce there presence not with the door bell, but with a holler. When we had company, sometimes Maa would call me in from the playground, tuck in the money in my hands and I would walk with a friend or a cousin to the neighborhood sweet shop. Whenever there is company in a Bengali home, they must leave with “Mishti Mookh“, a”sweetened mouth”….Sandesh, Roshogolla, Pantua, Chanar Jilipi and hundred other kind lined in neat piles inside the glass shelves remain so clear in my memories. Malai Chom Chom of course. The cylindrical or tear drop shaped Mishti that was cradled in cupcake liner kind of papers, sometimes with a dusting of green specks of pistachio, khoya and a little slice of red cherry. They were pretty. They called my name. My eyes would move past the other sweets to these Malai Chom Choms, the light green Aam Sandesh (green mango flavored Sandesh) and the chocolate flavored Sandesh. In Bengal, Mishti are for any hour of the day. There do not have to a special occasions or a festivals. It is not only for company or dessert. It is more like a dedication to the sweet traditions which began centuries ago. It is like an unconscious effort that everyone strives to maintain to keep up the legacy. 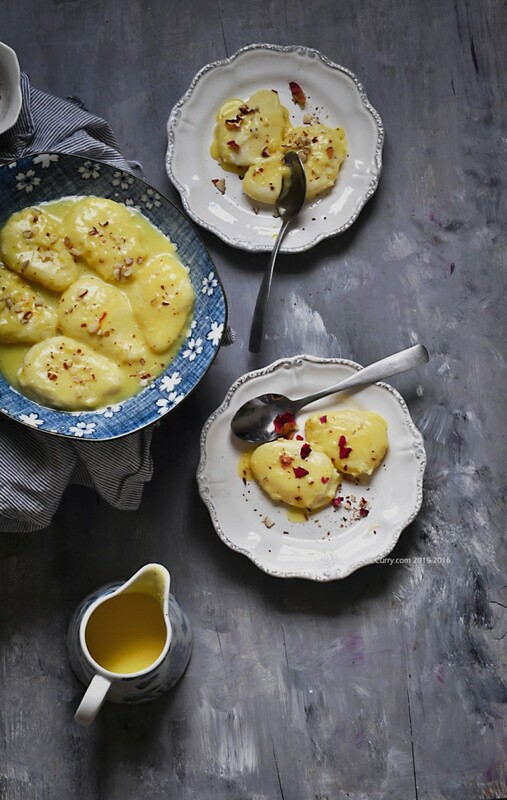 Mishti is that eternal, lively romance of the Bengali gastronomy. I was not much of a sweet eater. As much as I yearn for the sweets back home now, nostalgia enveloping me, to walk those same streets, to re-live those days when all of it was available so easily, I would never take more than a bite. The excitement persisted only in the independence in picking out my favorites from so many of them, to hold the white cardboard boxes, lined with thin parchment paper and the sweets and carry them home. That feeling of pride to have been able to help Maa, to have contributed in hospitality still swells in me. I never had Cha and Chom Chom with merry company. I never woke up to want to find gratification in biting into the cream layered Malai Chom Chom or the chilled spongy Roshogolla. Now I dream, I wish… I did. Regretting the lost time. Repentant, almost guilty of the disinterest in the classic slice of Bengali gastronomy. How could I not? As the dove gurgles now in the hot summer afternoon, I desire a bite. I want to close my eyes and relish every molecule of of the chilled Malai Chom Chom. As the rain falls like crystal tears, I envision a plateful of all that I turned down. 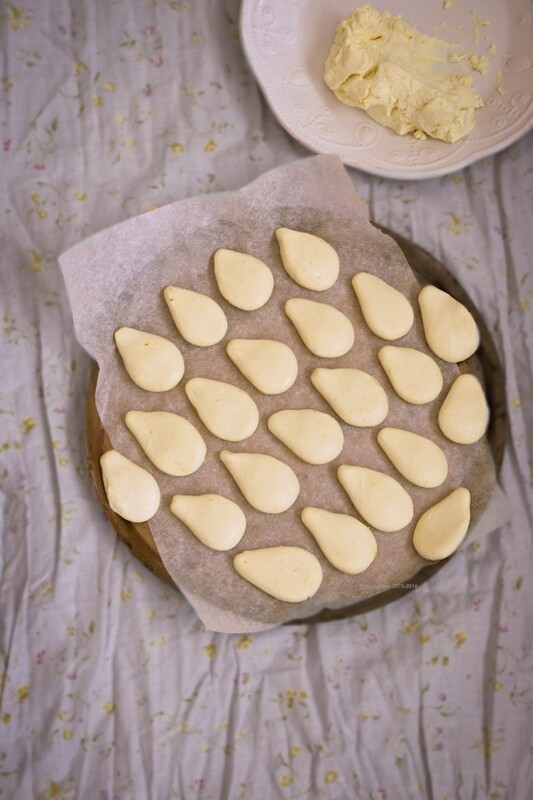 As I stand kneading the chenna soon to be turned into these teardrop shaped Malai Chom Chom, I miss the ease of just walking down the street to get a few from the stores. The Mishti at home was made to perfection in the stores. Every one had their favorite. Every store specialized in some kind of Mishti. There hardly are any out there back home, who will go through the process of making these at home. The yearning, followed by the unavailability of that perfect taste however have taught me. That I want and cannot have with ease, have been the inspiration for me make these at home. 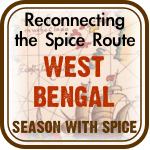 For this is the only way we find contentment to surrender to the sweet tradition of Bengal. 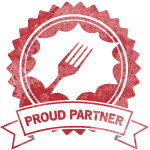 Keep in mind here that the look, feel and the taste of Chom Chom varies from one part of the state to another. 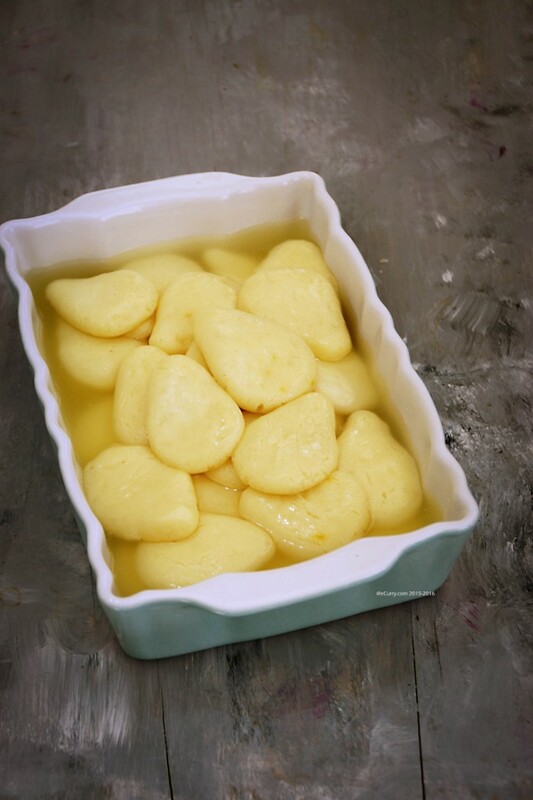 Some regions cook the Chom Chom longer in the syrup resulting in a not so spongy, but with a bite – the light caramel color sweets. Whereas some regions have them tender and purely white. Depending on the Chom Chom, the Malai Chom Chom come in different varieties too. The recipe today is based on the spongy, softer ones. I am making no claims that this is the exact way it is done back home. I have made use of the easily available conveniences. What I strive is to get as close to the original taste and this worked pretty well. Back home the Malai Chom Chom are whiter, saffron being an expensive spice which the shops cannot afford. However the process of making them remains pretty much the same everywhere. 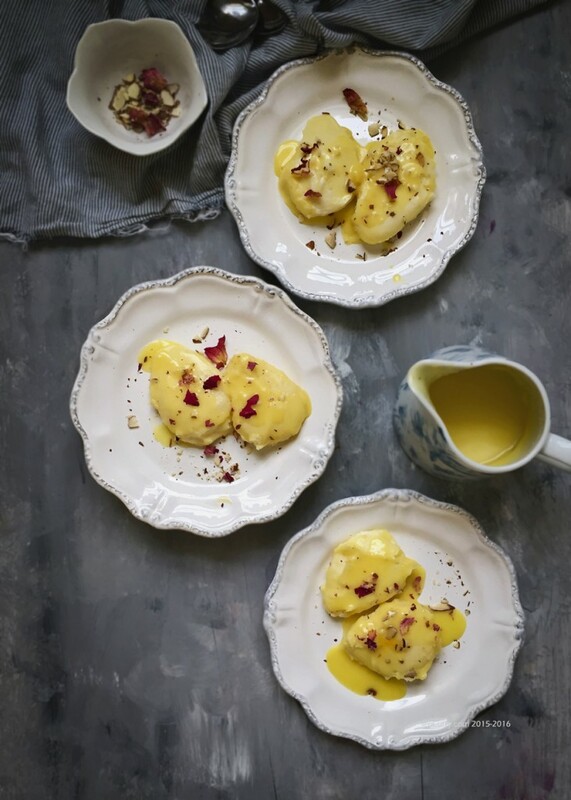 Sayantani has a recipe in her blog which uses the traditional method of making the malai or the cream from milk. Check out her recipe if you want to. I have tried to photograph a few of the steps to this recipe. 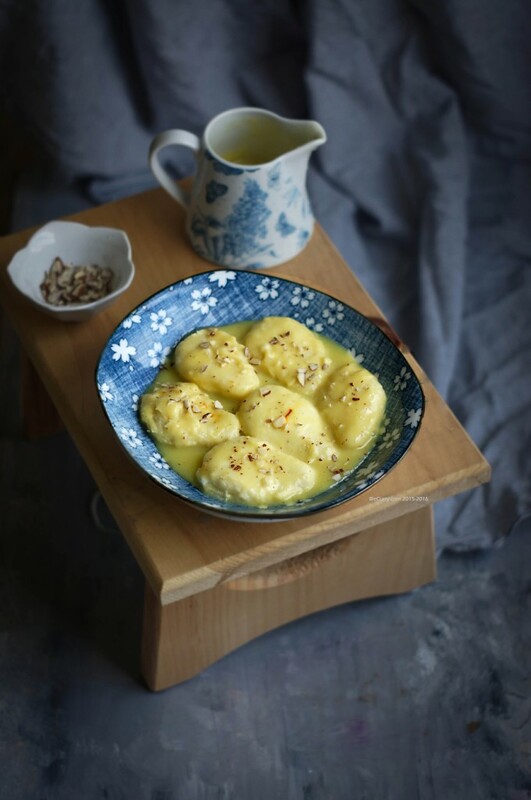 The base recipe for the Chom Chom is the recipe of Roshogolla that has been posted before, the difference being only in the shape. So please refer to that very detailed and step by step photos of the recipe of the Roshogolla is this would be the first time you are making it. The recipe below includes all details, but for the first time, a visual might help. Step 1: Make and drain the chenna/cheese. Next knead it well with saffron. It will be a smooth and not sticky, and when rolled will coat your palms with the fat. Shape them, a few at a time. Any shape will do. The traditional shapes are tear drop or like a cylinder. It works out better to have a larger surface area for the cream to be stuffed and also for the coating. Cook them as per instructions/recipe. On the right are the chom chom after they were cooked, soaking in saffron flavored syrup (the saffron is not essential here, but adds a nice flavor). Whisk heavy whipping/double cream until soft peaks form. Sweeten it and add flavor. Slit each Chom Chom (from which some syrup has been gently squeezed out) and stuff with the cream. Chill. 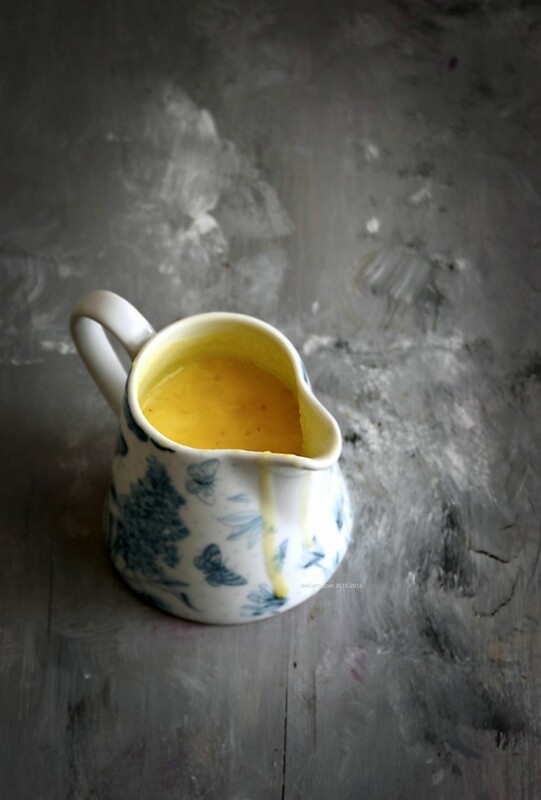 Heavy cream is slowly cooked with sugar, cardamom and saffron until it gets the consistency of condensed milk. Thick enough to coat a spoon. This will be what the Chom Choms will be coated with. Pour part of the cream on a tray and place the chilled and stuffed Chom Choms on the cream. Pour or spoon over the rest of the cream on the Chom Choms. Then chill and garnish before serving. Hope you would make this journey with me: connecting to the past is my way to live! Malai Chom Chom is also called Kheer Chom Chom! “Chom Chom” is a truly Bengali word. It is known as Cham Cham or Chum Chum in other parts of India. 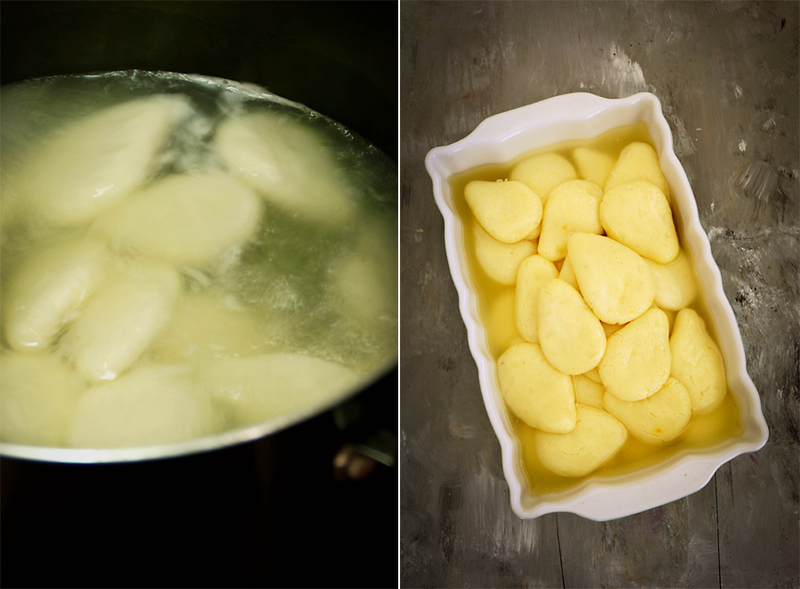 A lot of recipes use maida (all purpose flour) or fine semolina to make Rasgulla or Chomchom. I have used none. I never do. However, you may very lightly dust the work surface with some all purpose flour to make kneading and rolling easier on you. However if you get the consistency of the channa or the fresh cheese right, you will need no flour or semolina. If you need extra water or sugar, use it. The amounts are approximate here and might differ a bit in the process of making them. *Note: You might have some leftover cream. Save it for some other purposes. The chenna/cheese was not rightly done. If during the process of coagulating that milk, the milk solids harden (too much acid, too long in the whey after it split or cooked too long… could be all or any of these) the Chom Chom will not form right and hence will not puff and swell and get spongy. The syrup got too thick. The syrup should be thin and light. As soon as you see the sugar has dissolved and water has come to a roaring boil, add your first set of the Chom Chom to cook. When the first set is done and you see that the syrup has thickened or reduced in volume, add more water and a little bit of sugar and allow it to come to a roaring boil again before you add another batch of the Chom Chom. The Chom Chom cooked for too long: If you are using a pressure cooker with a whistle, it will take only one whistle for the Chom Chom to be done. (the time includes the cooker heating up and getting ready for the steam). If you are using a pot with a lid, it will take anywhere from 14 – 20 minutes, with opening a lid and releasing the steam once during the process. Remove the batch of Chom Chom with some syrup – enough for the cooked Chom Chom to be immersed completely and let them soak in this after they have been cooked. If you cook them for too long they will start to lose the pure white color, and the smoothness of the texture. (They will finally turn this way but not during the cooking process but when they stay immersed in the syrup for a while). If they start looking this way while cooking, they will turn even more stiff after they are done. The outside of the uncooked Chom Chom hardened/crusted. 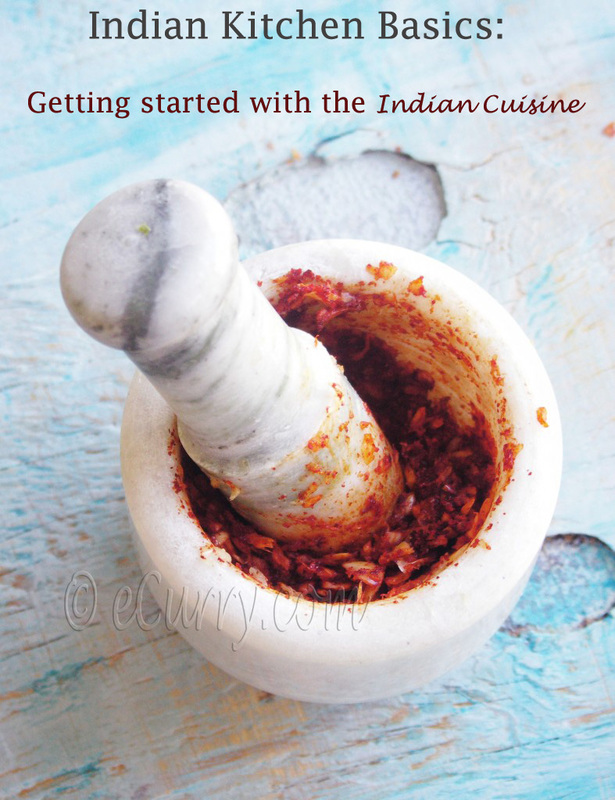 Cook the Chom Chom in batches. If they are overcrowded they will knock against each other and the chances are they might dissolve. They are very delicate and soft during the first few minutes. Besides, if you roll a lot the Chom Chom and leave them in open air, the outside of the Chom Chom will form a thin crusty layer and when you cook them, it will prevent the syrup to go in. So roll a few and cook them. While they are cooking, get the other batch ready. Pour the milk into a deep heavy bottomed pot. Bring the milk to a boil. When the milk comes to a roaring boil, addd the lemon juice (or vinegar) a little at a time (about a tablespoon), and lower the heat. Keep stirring the milk as you add the lemon juice. After a few tablespoons (this amount might differ and if the milk has already started splitting you do not have to use up the entire amount mentioned above. On the other hand, if you need more, use more), the milk will start separating and you will a greenish but clear (not milky looking) whey along with the curdled milk. Now immediately stop adding the lemon juice/or vinegar and stop stirring. If too much of the curdling agent, the chenna/ cheese will be tough and also sour. Turn off the heat, remove the pot from the stove and allow the curdled milk to sit for about 8-12 minutes. Do not stir. Place a cheese cloth or a very fine cotton cloth (make sure it is big enough as the cheese needs to be wrapped up and tied and hung) over a colander or strainer. You can place the colander/strainer over a large pot to collect the whey (the whey is healthy and can be actually be used to split the milk again for Rasgulla/Chom Chom!! or it is a good idea to make a bread dough with the whey in place of water). Carefully pour/or remove with a ladle, the curdled milk into the lined colander. Give the chenna/cheese a quick wash with a spray of cold water. This removes the smell of the curdling agent and also prevents the cheese from getting stiff. Allow the whey to drain completely, about 15 – 30 minutes. You can loosely cover the cheese with one end of the cloth so the surface does not dry out and form a layer of crust. Gather the end of the cheese cloth and wring out any extra moisture; hang it and allow any left over whey to drip out. (I will usually hang it to a cabinet knob or the tap of the kitchen sink.). Leave it this way for about an hour to 2 hours. When you squeeze there should be no more moisture dripping out and yet the cheese/chenna should not be completely dried out. After hang draining, I usually layer kitchen or paper towels and place the chenna with the cloth on this thick layer, cover the chenna with the cloth and put a heavy weight (a large granite mortar and pestle in my kitchen) and leave it for about 30 -45 minutes for further soaking up of the fluid. Once done the chenna would be dry enough (but still moist) and will be easily peeling off the cloth in thick chunks. It should be really soft and moist when pressed between fingers. After hanging and proper draining, the cheese needs to be kneaded. 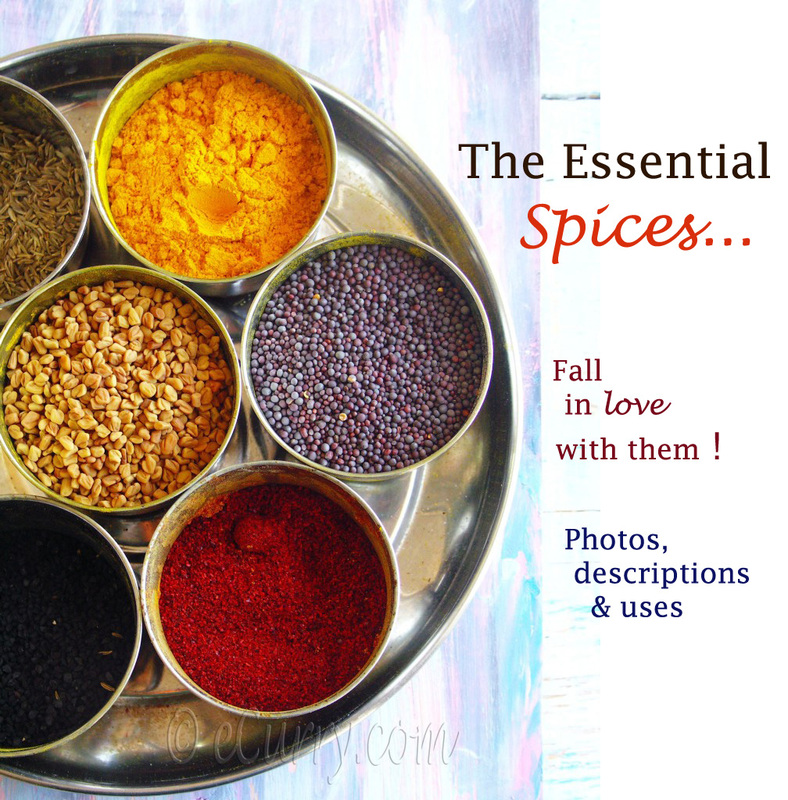 Toast the saffron strands very lightly in a dry skillet. It requires only about a minute. Just placing them on a hot skillet will do the trick. Remove from heat, crumble gently between your fingers and sprinkle on the cheese/chenna. Fold the cheese on the saffron. The cheese will be kneaded with the saffron for the subtle flavors to infuse. The kneading of the cheese is very important. You can either use a food processor, or knead with hand. After kneading it should be smooth and creamy like mascarpone cheese but when gathered into a ball, it should do so easily without leaving trails and smears on the board or the counter top. The kneading should be perfect and long enough so as the fat in the cheese comes out and prevents it from sticking. The consistency should be almost like a dough (but not stretchy like flour). The kneading needs to be done well and for long enough to achieve the above mentioned texture – about 20 minutes if done by hand. You may knead it over a board/stone/counter top or in a large tray. Sprinkle some all purpose flour on the surface if you need to. However for a well drained cheese, you will not require the flour. We usually knead it with the heel of the palm, and the palm. The way it is done is kneading parts of it away from you towards the outer edge and bringing it back to you and repeating the back and forth motion. It is a different kind of kneading than that of a bread. A food processor may be used too. The machine saves time and energy and works just well. Divide the dough into 20 – 25 rough portions. Roll about 10 of them in your palms. You can roll them in cylinders or in tear drop shape like I did. To make the tear drop shape, roll in cylindrical shape and then gently press down or roll into a point, but only one end. Then flatten the dough with the palm of your hands. The shape is not important. You may shape them into anything you want. However with the cream stuffing a longer surface works well. Once shaped, they should be smooth without holes or lines going across them. Make these in batches as you cook; if too many are rolled and left in the open, the surface dries up and forms a crust and when cooked they will be tough as the crust prevents the syrup from going in. The sugar is added to the syrup in two steps. Only a little sugar is added the first time as less amount of sugar in the syrup allows the cheese balls to absorb the syrup better. Add half the sugar to the water and bring the sugar and water to a boil until the sugar has completely dissolved and the solution is in roaring boil. Just before you add the shaped Chom Choms, reduce the heat to medium-high. If there are too many you might have to cook them in batches. After a couple of sets, the sugar syrup will thicken; add some hot water and some sugar to replenish and bring it back to the original consistency. The level of the liquid should be just high enough that they completely submerge. Put a few Chom Choms in boiling syrup. Cover and cook. They will puff up in about 10 – 15 minutes. You may uncover and release the steam only once during the cooking process. Do not move around them as they are cooking. The cooking time will depend on the size of the Chom Chom. Remove them as soon as they puff up. An easy test to see if they are done is to remove one and drop it in a cup of cold water. If it floats, it needs to be further cooked. When they are done the texture should be spongy and should bounce back when held down with the back of a spoon or a finger. Once each batch is cooked, remove them from the pot and place them in some sugar syrup which you can remove from the pot. Once they are all cooked, add the rest of the sugar to the remaining syrup. (if you think there is too less syrup, add more water). Simmer until all sugar is absorbed. Remove pot from heat and add a cup of cold water. Now add the flavoring if you are using any ( I used rose water). Put the cooked Chom Chom back in this syrup and put in the refrigerate. The Chom Choms may be cooked ahead (even a day ahead) before you go ahead and complete the dish (stuffing and coating them). Take about 3/4 cup (8 oz measure cup) of the heavy whipping cream and set aside to chill. Remove seeds of the cardamom. Set aside seeds of one cardamom. Grinds the seeds to a powder. Grind the seeds of the one separated cardamom and powder it too. This one cardamom will be added to the stuffing. Slightly toast the saffron in the same pan where the cream is to be prepared/cooked. Once toasted and cooled, crush it and combine with the heavy cream. In the same thick bottomed pan heat the rest of the heavy whipping cream. Add the sugar and the greater amount of the powdered cardamom, and cook while occasionally stirring to prevent it from sticking to the pan. Bring it a boil and then you will have to cook this at low heat for about an hour to an hour and fifteen minutes. 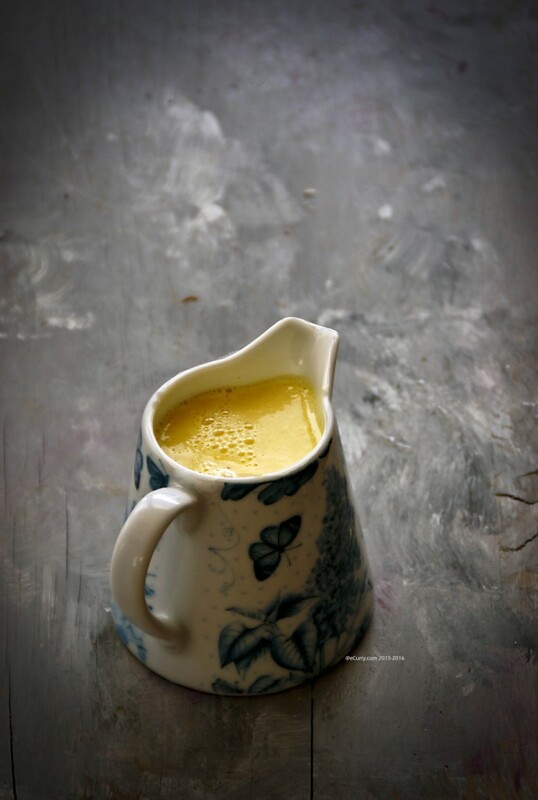 The consistency of the cream will thicken a lot and will turn like canned condensed milk. 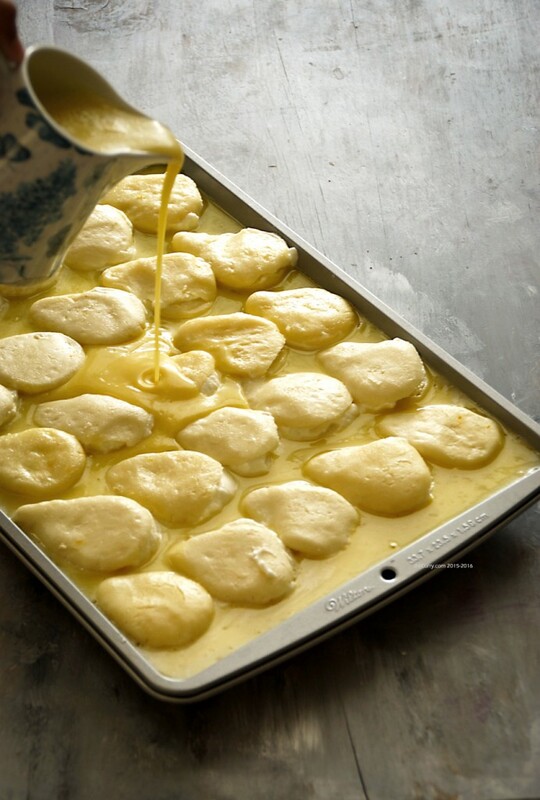 Once cooled, add the rose water and set aside. Take out the chilled heavy cream. Add the cardamom powder (of one cardamom) and whisk until soft peaks form. Fold in the confectioners sugar and the 1/4 teaspoon rosewater.if not ready to stuff to the chomchoms yet, keep it back in the refrigerator to chill. When ready to stuff, remove one chomchom at a time from the syrup it is soaking in and press/squeeze each one of them gently between the palm of your hands to remove some of the syrup, not entirely though. This will allow it to soak up the cream it will be coated with. Set them in a tray. Next make slits in each one of them to divide them horizontally. You can leave one end intact. Remove the whisked chilled cream from the refrigerator. Using a spoon, carefully stuff some of the chilled cream into each of the chomchom. Once all of them are stuffed, they will be coated with the cooked saffron cream. 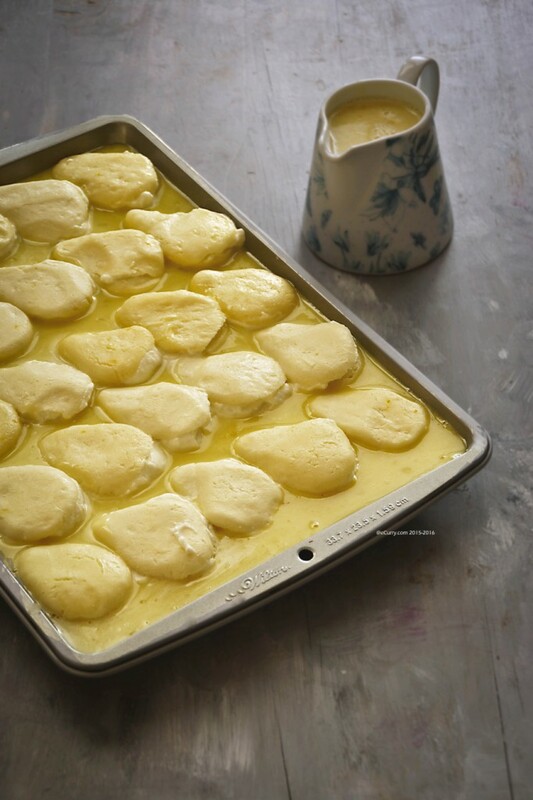 In a large tray or plate (big enough to hold all the chomchoms in a single layer, close together: I used a baking tray), pour or spoon out about half of the cooked cream. Place the stuffed chomchoms in a single layer over this cream. Pour or spoon the rest of the cream over each of the stuffed chomchoms. Place them in the refrigerator to chill. Serve when they are really well chilled. The saffron cream would have thickened and coated each chomchom . Garnish with chopped nuts and rose petals if you wish. Traditionally grated khoya or solidified milk is used to garnish too. Refrigerate as soon as you are done making them. Most of the cooked cream surrounding the Chom Chom would have been absorbed and coated the sweets. Will keep good and fresh for about 4 days. This was an amazing write up. They look oh so good. I loved the history behind this dish. Your photos are awesome. Sharing . Have a wonderful week. Sarah. Enjoyed reading the post. Thanks for the detailed recipe. Will try it out soon. 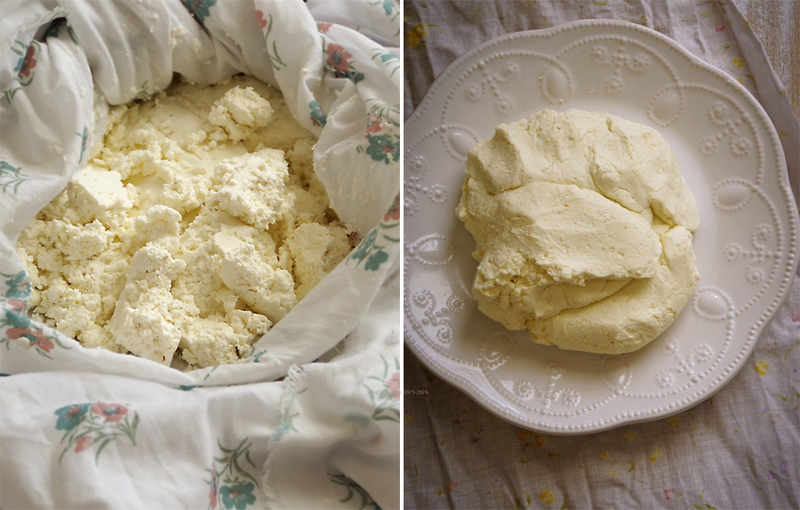 Have a question regarding the Cheese – Can we use store bought Ricotta Cheese for making the Chom Chom? Amazing post. Loved every bit of it !!!! 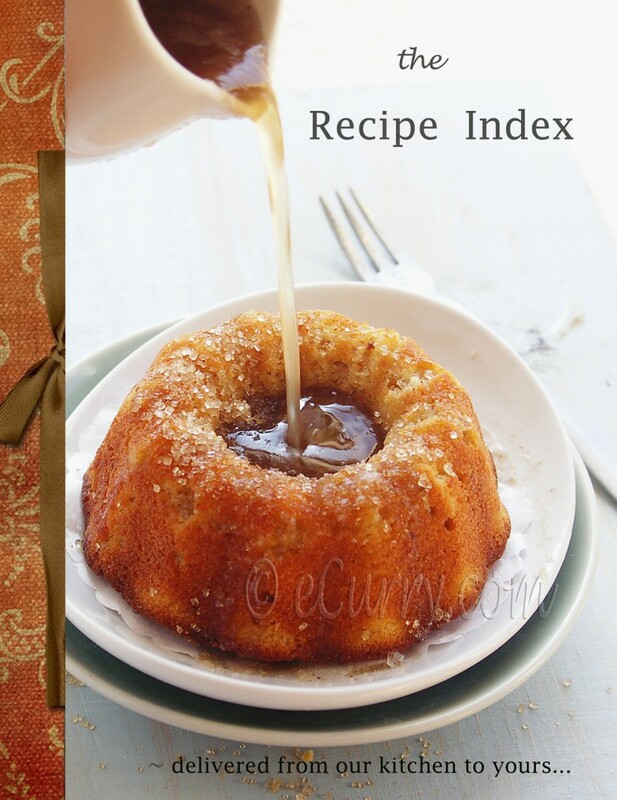 This looks absolutely yummy – hope I might be brave enough to attempt making it some time! Hope you had a wonderful summer with your family. All the best, Soma.